When tragedy strikes we feel the need to do something, anything, to make it better. Sometimes there are no actions that can be taken. All we can do is be there to comfort each other. The only thing that can make things better is time. Comfort can come in many forms; kind words, a hug, or even a cookie (or two) with a tall glass of milk. 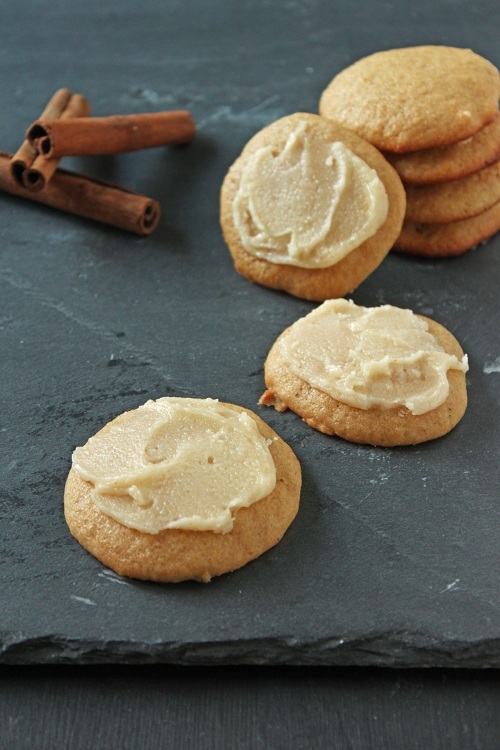 These cookies were adapted from Martha Stewart’s Pumpkin cookies. I substituted unsweetened apple sauce for the pumpkin puree. Since apple sauce is much thinner than pumpkin puree, I strained the sauce with a coffee filter to get a thicker consistency. You could also try cooking the sauce down. The cookies have a very cake like texture. 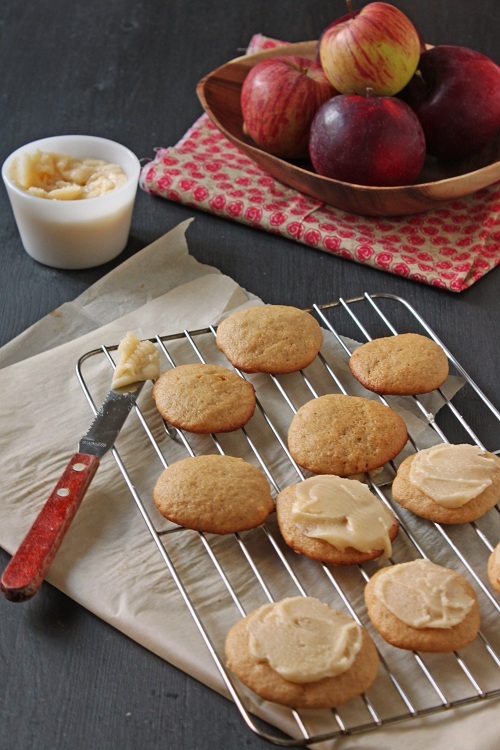 The apple flavour came through very well, and was wonderfully complemented by the brown butter icing. One note on the icing, make sure to whip it well otherwise the butter will separate. Preheat the oven to 375 F. Line two baking sheets with parchment. Set aside. In a medium bowl, whisk the flour, baking powder, baking soda, salt, and spices together. Set aside. In a large bowl, beat the butter and sugars together until light and fluffy (about 3 minutes with an electric mixer). Mix in the eggs, followed by the apple sauce, evaporated milk, and vanilla. Add the flour, mixing till well combined. The batter will be quite thin. Spoon the dough onto the prepared baking sheets, making cookies approximately 1 inch rounds, spaced 1 inch apart. Bake for 12 to 15 minutes, until the bottoms are lightly browned and the tops spring back when pressed. Let cool completely on a wire rack before icing. Put the powdered sugar in a mixing bowl, set aside. In a medium saucepan melt the butter over medium heat. Cook, stirring occasionally until the butter becomes golden brown and smells nutty. Pour the melted butter over the powdered sugar, making sure to scrape the brown butter bits in as well. Add the evaporated milk and vanilla. Beat with an electric mixer until smooth. Use to ice cooled cookies. Thanks, Jen. I’m ok, just going through some family stuff. Hugs to you, Lynn. I hope these cookies had their intended effect, and that things are looking just a little brighter in your corner of the world. Cookies can indeed be comforting and I hope that these were able to bring you a little comfort! I hope you’re doing well and your comforting cookies look just perfect! Hope everything is OK, Lynn! These cookies look fantastic. They’d cheer me up on a bad day. Hi! The atmosphere in every corner of the world is getting to be more and more festive as the days go by…Thanksgiving, Christmas, New year…Holidays are here again. I got a little worried that your blog was a little sad to start with. But you managed to lift the spirits up with this wonderful combination in your cookie recipe…Hope everything turns out fine in your family life…Thanks Lynn! Lynn, I hope everything is okay! The cookies look lovely and would certainly be comforting. thinking of you. We are going to try these for Thanksgiving and to send back to college with some folks. Lets hope they turn out as good as they look! I’ve been looking for a new cookie recipe to try. I think this is it!